Dumfries’s Scott Beveridge and Niall Alexander have been picked for the Border Reivers one day game against the Dutch side the Northern Hurricanes, in Glasgow on Monday, in the North Sea Pro Series. Beveridge also plays in the Twenty20 game on Sunday. The Reivers come to Nunholm to play more games in the Pro Series in June with a T20 match on Monday the 2nd June and a one day game on Tuesday the 3rd June. Also on Sunday and Monday, Dumfries Women’s team player Kirsty Strachan is with the Scotland Women’s team for their County Championship matches at Northants and Hampshire. 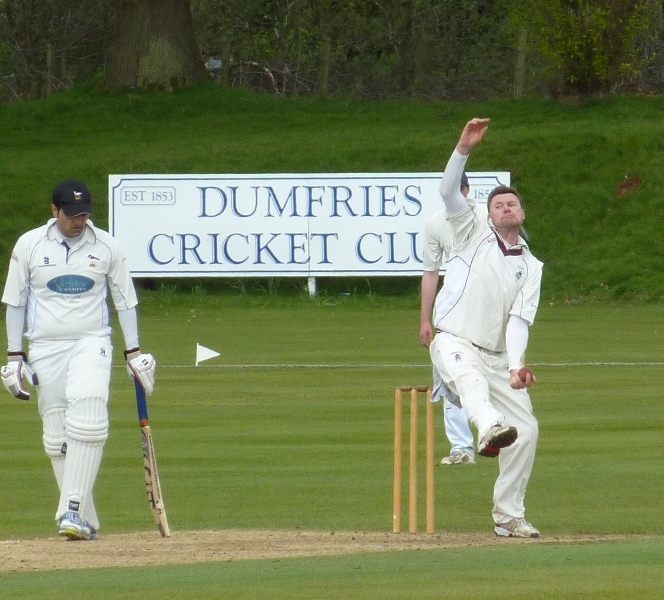 New players are welcome and the club can be contacted for details on dumfriescricketclub@gmail.com or 07799 856094, or come along to training at the Dumfries Sports Club at Nunholm on Tuesdays from 6pm, or see www.dumfriescricketclub.co.uk . Junior cricket: Junior coaching sessions are underway for the summer on Mondays, 6:15-8, for boys and girls, suitable for ages 8 to S2. For details contact Trefor Williams on 01387 256455, or the club as above, or come along on the night.